Blur pop-art self portrait flash vector drawing. 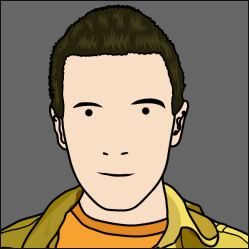 Drawn in the same style as my 2001 classic, this pop-art style self portrait updates my profile from that of a scruffy youth to something a little more up-to-date. The use of a photo, some tracing, and a little artistic license all comes together in this picture. Drawn solely using vectors in Flash 8 and saved out using Paint Shop Pro.